who are looking for this kind of job opportunity they can submit their application form along with all required documents to be reachable to ZSS Rayagada on or before 31-08-2017. Candidates will be selected based on interview for this ZSS Rayagada Jobs. Interview will be held on 05-09-2017 by 11:00 AM at CDMO Rayagada. Candidates must have bring the original Certificates for verification at the time of interview. 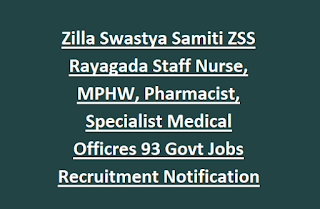 For more details regarding this ZSS Rayagada District Vacancies Staff Nurse, Lab Technician, Specialist Medical Officers, MPHW and Pharmacist Jobs educational qualifications, pay scale and other details are given below. There are total 93 vacancies in this ZSS Rayagada Recruitment 2017. For specialist officers jobs upper age limits is 68 years and for all other paramedical jobs upper age limits is 65 years. For Specialist Medical Officers: Post Graduation Degree in Respective Specialization with at least 5 years of experience and must have valid PG Medical Council Certificate. For Staff Nurse Jobs- 10+2 or HSE with 3 Years GNM Diploma Course and registration with Odisha Nursing Council. For MPHW Female-Must have passed HSC examination and Health Worker Training Course. For Pharmacist- 10+2 With Science and D Pharma from any recognized university. 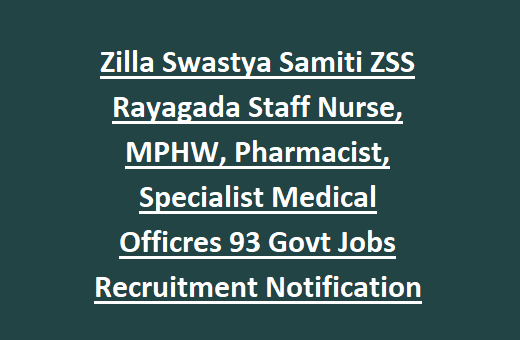 Selection for this ZSS Rayagada CDMO Specialist Medical officers and Paramedical posts recruitment will be held through a personal interview and merit in qualifying examinations. Eligible candidates may send their application form in a prescribed format to ZSS Rayagada on or before 31-08-2017 along with all required documents. And bring the same another set of copies along with original certificates at the time of attending the interview at the chamber of CDMO Rayagada.